Fall is by far one of the most magical and wonderful seasons we have the opportunity to experience. The air gets crisper and cooler, the leaves turn into a rainbow of colors crunching beneath your feet, and football is all around. It’s truly the perfect season after the glaring heat of summer and right before the frigid, icy winter. It’s a time for bonfires, pumpkin spice, Halloween and Thanksgiving, and a divine period of natural beauty that is hard to beat. Not to mention we see the return of flannel shirts and sweatshirts, which are my personal favorites to live in all autumn long. Of course, if all of those things weren’t reason enough for you to love fall already, it’s worth mentioning that fall is also the most frugal season, and who doesn’t love the opportunity to save money? 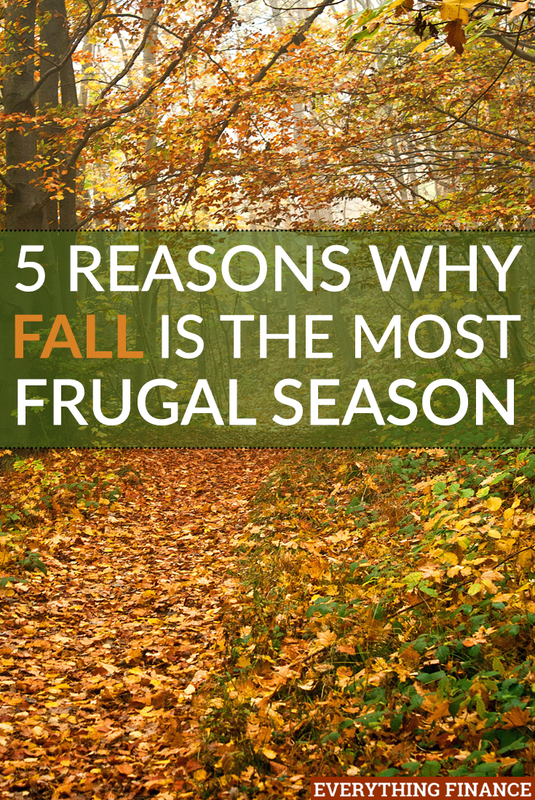 Here are five reasons fall is the most frugal season of all. Summer and winter are all about climate control. During the summer your house works overtime to keep things cool, and during the winter it works harder to keep your home warm. Fall, however, is often a comfortable temperature that doesn’t need much indoor adjustment. Instead of cranking up the heating and air conditioning, for the most part, autumn is the time you can give your HVAC system a rest. Open the doors for some nice fresh air instead. Even if you do keep the air on, you won’t have to turn it up as drastically. You’re bound to save money on your utilities, and depending on your home, saving on utilities can make a major difference in your monthly budget. Not only are we coming off of summer, where lots of fruits and vegetables are still around, but fall is deemed harvest time. Due to the two plentiful seasons of growing, produce tends to be in abundance. Anyone who knows the rule of supply and demand will tell you that when you have a surplus of inventory, the price ultimately goes down. Unlike during the winter, when various produce isn’t in season and you may have to splurge to purchase certain ingredients, fall is the time to make recipes that uses a variety of vegetables. You’re bound to find lots of items on sale at cheaper prices. So not only are you saving money, but you can feed yourself and your family healthier options without feeling like you’re spending a fortune. If you’ve been trying to find fun forms of entertainment for you and your family, or for you and your friends, but are on a budget, autumn is definitely the time for you. Fall brings forth an array of great activities. The beautiful weather outside opens the door for lots of outdoor adventures and autumn tends to be the time for festivals of every kind. The summer heat can deter you from wanting to do too many fun things outside, which is why fall has the perfect outdoor weather. Whether you go on a hike or on the best entry level road bike ride or just talk a stroll around the park or your neighborhood, you’re sure to find one activity you enjoy that’s in the fresh air and completely free. Of course, if you’re looking for more entertainment than that, never fear, as fall is the designated time for festivals. You can choose to go to a beer or wine festival, harvest fest, or pumpkin and apple fests. There are events almost every weekend and for every person in the family. Furthermore, festivals are usually free to get into. You can decide how much you spend once inside depending on whether or not you purchase snacks and drinks or tickets to extra entertainment. Keep in mind, however, that once inside, most festivals have a variety of activities for kids and adults that are also free of cost. For most people and families, summer seems to be the peak travel time. Kids are out of school and things often slow down at various businesses. However, once school is back in swing, most destinations see a dip in tourism. That being said, autumn can be a great time to find plane tickets, hotels, and travel packages on sale. National parks and lodges will be a lot less crowded, which means they’ll put out special rates to draw tourists to their sites and fill their rooms. Furthermore, car and RV rentals tend to be cheaper after summer, which makes fall the perfect time to take a road trip if you need to rent a vehicle with more room. However you choose to travel, now is a great time to do it on a budget. Between the start of school, Labor Day, and the infamous Black Friday, fall is also the time for some major sales. If you’re in need of clothes, appliances, electronics, or even cookware and furniture, between these three big days, you can find a variety of items for great prices. Autumn can be a prime time to invest in a large purchase if you’re hoping to receive a great deal. If you’re really ambitious, it can also be a great time to do some early Christmas shopping to help keep you on budget. No matter your favorite season of the year, it’s hard to deny the beauty that comes with fall. The changing leaves bring forth a boldly hued landscape and the fresh, crisp air adds to the bliss of spending time outdoors. However, if those aren’t enough reasons to love fall, then you’re sure to love all the ways autumn can help you save money and stay on budget. Are there other ways you save money during the fall? What are some of your favorite fall activities on a budget?